Ron Stephanz won the regatta, but every competitor and guest were all huge winners because it was such a fun regatta! The Geezer Gatta is like no other regatta you have ever attended. RC skippers over 55 years old from around the country take part each year in this fun regatta. Anyone who has an interest in RC sailing can attend; you don’t have to be a world class skipper, just enjoy sailing in a competitive and friendly regatta that is hosted by the Lake Providence Radio Control Club. This is the easiest regatta for anyone to attend. Just register, bring a guest if you like and then show up. Leave your RC Laser at home. The club provides equal sailing RC Lasers for each skipper to use for the weekend as well as a host home for you and your guest to stay. Dinner for two nights, lunches and a snack breakfast are provided. This has been going on for six years, with a few skippers attending all seven Geezer Gattas. I would like to thank all the members of the Lake Providence RC club for showing the out of town skippers and their guests amazing southern hospitality and great sailing. Save the date for next year. We have a beautiful gated community with our own 15 acre lake within the property. 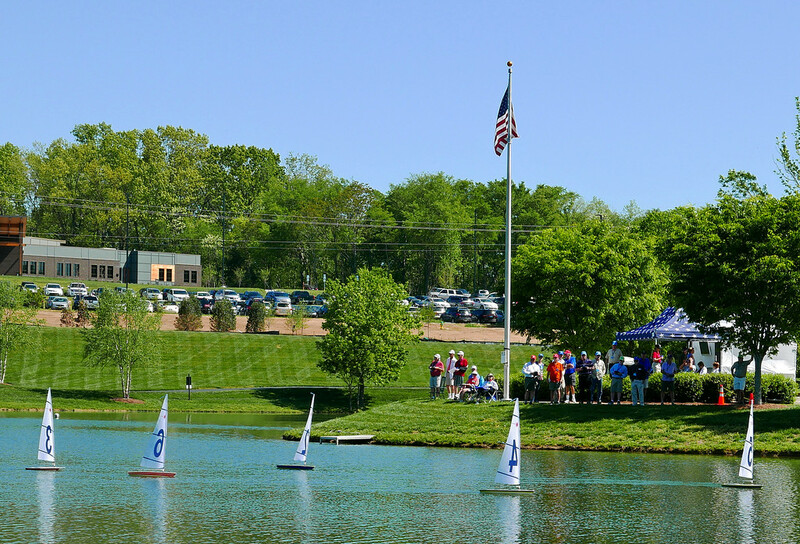 The club provides the boats for the event and tunes the boats to the same specifications. We had 21 sailors, 5 from our own club, and 16 from around the country. Having fun at our event while enjoying friends and food is our first priority. We expect our participants to be Corinthian sailors and to acknowledge a foul and take the appropriate response without a lot of discussion or debate. Our regattas have come off smoothly because our sailors buy into this philosophy. We award trophies for both individual and team performance in our regatta. Each team is made up of three sailors. The sailors complete a skills survey with their registration. The skills survey is used to balance out the skill level of each of the teams to give each a chance at winning a team award. This also creates an environment of camaraderie and support among team members. We had great weather for our racing weekend. Temperatures were in the high 70s to low 80s both days. Winds were 5-10 mph which is very nice for sailing. We had very few races that experienced dead air and when we did it was usually only for a portion of the race.